1. I am happy to be at Air Force Station Hasimara to award Standards to 18 Squadron and 22 Squadron. 2. Both these Squadrons have distinguished themselves in the service of the Nation. They have a rich history of professional excellence and have served the Nation with honour and distinction in peace and during the two wars. The Nation honours them today with a deep sense of gratitude and appreciation for their selfless devotion, professionalism and courage in the face of adversity. I compliment the Air-Warriors on parade for their impeccable turnout and outstanding precision of movements. I am happy to see a well coordinated fly past and an immaculate aerobatic display. 3. 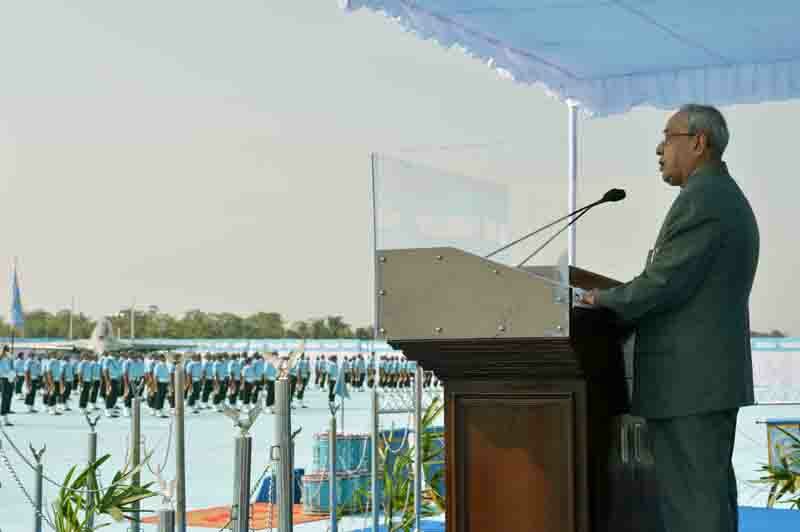 India’s increasing eminence in the comity of Nations draws its strength from the capabilities of our Armed Forces. Though we remain firmly committed to peace, we will use all our might to protect the sovereignty of our Nation, and I am confident that our valiant men and women in uniform will rise to the occasion. Our Armed Forces, exemplified by the Air-Warriors who stand before us, reflect our steely resolve to defend our interests. 4. The Indian Air Force is the cutting edge of our Nation’s military might. Excellent performance of its personnel in international exercises, both at home and abroad, is indeed a glowing testimony to the level of training and preparedness of our Air Force. The Indian Air Force, besides safeguarding the sovereign skies of our Nation, has also been at the forefront of all humanitarian aid and disaster relief operations, most notably Op Rahat and the recent earthquake in Nepal. The resilience and tenacity displayed by our valiant Air-Warriors is a great source of pride for the Nation. 5. 18 Squadron or ‘Flying Bullets’ was formed on 15 April 1965 at Ambala. It was then equipped with world’s smallest fighter aircraft, the Gnats. Whether flying the Gnats or the lethal MiG-27 ML aircraft, the Squadron has an enviable operational record. The Nation still remembers the sublime heroism and supreme sacrifice of Flying Officer Nirmal Jeet Singh Sekhon, Param Vir Chakra of this very Squadron that continues to inspire one and all. Flying Bullets continue to live up to the motto of ‘Teevra Aur Nirbhay’. On their completion of 50 glorious years of gallant service to the Nation, I am very confident that ‘Flying Bullets’ will continue to operate as a formidable fighting force. 6. 22 Squadron, known as ‘Swifts’ was raised on 15 Oct 1966 inBareilly and equipped with Gnat Mk-I aircraft. On22 Nov 1971, during the ‘Air Offensive for Liberation of Bangladesh’, the Squadron drew first blood by shooting down three F-86 Sabre jets over Jessorein a single sortie.For its daring and excellence, the Squadron was rechristened as ‘Sabre Slayers’and decorated with Battle Honour.Today, operating the MiG-27 ML aircraft, they continue to take to the sky with the same fortitude and zeal in keeping with their motto of "Sahasam Vijayate” or "Courage Triumphs”. As 22 Squadron completes 50 glorious years in the service of the Nation, I am confident that the Swifts will continue to provide yeoman service to the nation and the Indian Air Force. 22 Squadron. On this occasion I take the opportunity to compliment the personnel and families of 18 Squadron and 22 Squadron, past and present, for their selfless sacrifice and service to the Nation. The Nation is indeed proud of you. I wish you and your families the very best and a glorious future.